Eastern Regional 250SX Class series, where Monster Energy/Pro Circuit Kawasaki''s Austin Forkner put himself atop the results sheet and therefore the points lead. After two years without a win Cooper Webb rode calm, cool and collected for his third win of 2019. He is the only multiple-round winner of 2019 after six events. Photo Credit: Feld Entertainment, Inc.
Just as he did in his heat race, in the Main Event Webb hugged the inside of the first turn to grab the holeshot, but Monster Energy Kawasaki''s rookie Joey Savatgy slipped into the lead before the second turn. Savatgy, who was the fastest qualifier earlier in the day, rode smoothly and without any major mistakes even with the pressure of Webb, Team Honda HRC''s Ken Roczen, round two winner Team Rocky Mountain ATV/MC KTM WPS'' Blake Baggett, and Webb''s teammate at Red Bull KTM Marvin Musquin on him the whole time. Point leader Eli Tomac, teammate of Savatgy on Monster Energy Kawasaki, was pinched off at the start and found himself in 16th place with a lot of ground to make up if he wanted to hold onto the red plate that marks the points leader. Up front, Savatgy was alternately pulling a small gap on Webb or fending off heavy pressure from the KTM rider. Just past the half way point Savatgy made a bobble after a triple and Webb got past. Webb opened a quick gap on the pack, and when Roczen finally passed into second the gap to Webb was over three seconds. Baggett and Musquin also made their way past Savatgy in the final quarter of the race, then Baggett shorted a jump in the rhythm section and walked off the track and out of the race. Cooper Webb brought the win home, and Roczen crossed in second, earning the red plate and points lead but, yet to win a race this year. Roczen has had two tough seasons and this marks the first time in three years that he''s still in the series after the sixth round - and with the points lead no less. Tomac eventually reached sixth place, dropping him to two points back in the points chase. 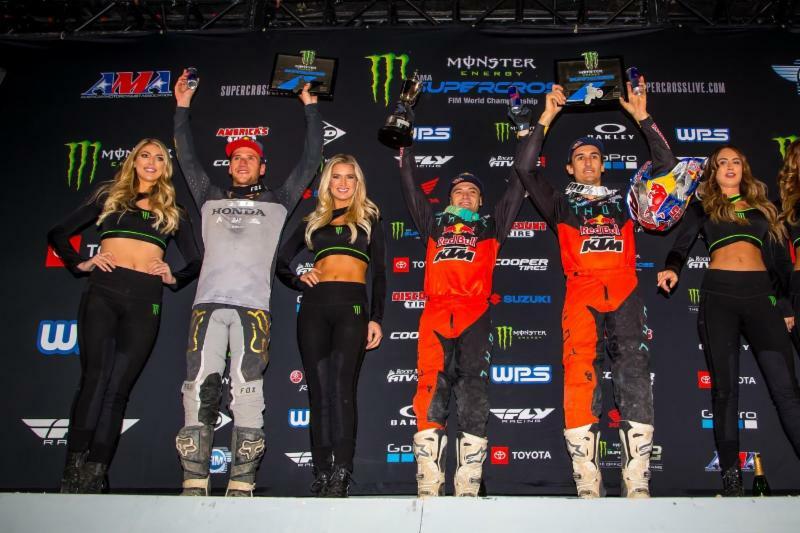 The 450SX Class podium, left to right: Ken Roczen, Cooper Webb, and Marvin Musquin. 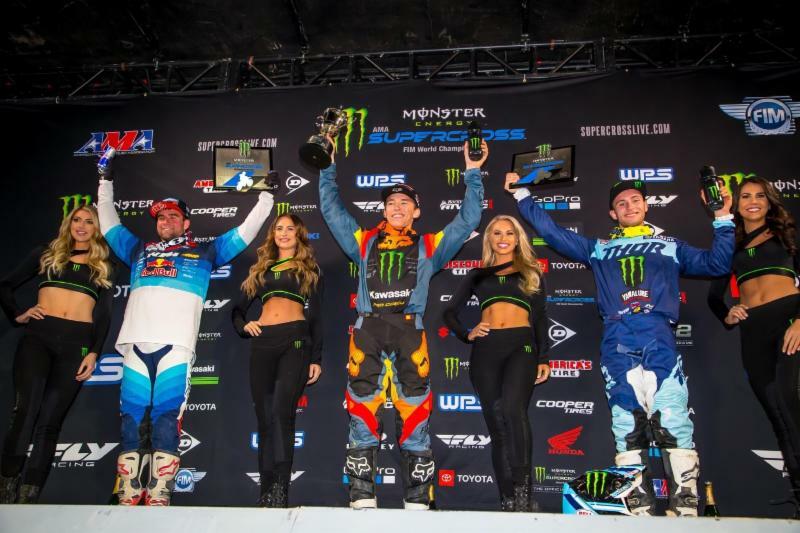 Photo Credit: Feld Entertainment, Inc.
On the podium race winner Cooper Webb said, "...Man, I''m stoked, I really am. I sat here in the Asterisk Rig [Mobile Medical Unit] the last two years, one with a blown-out shoulder, and last year with with a broken leg. And last year I contemplated a lot sitting right here in this very, exact stadium. It''s pretty bittersweet. It''s funny how the world goes ''round and, you know, it can be such a devastating moment in racing one year and the next year you''re at the highest of highs. So, it''s a pretty incredible journey, for sure, and man, just three wins is insane, it really is. I''m stoked, man, I really am. And to have it clicking like this, and I really enjoy these east coast tracks. You know it was hard to pass but [I] stayed patient and waited for a mistake from Joey and was able to capitalize and ride my own race and it was awesome out there..."
Roczen said just after re-claiming the red plate in 2019, "I had a little wheelie on the start and came around in third and was just in third for forever. It''s really hard to pass out here. I mean, it gets rutty but we''re all taking kind of similar lines and it was tough. Once I got by Joey - I wish I could have had a clear lap earlier because I feel like I could have done a charge towards the end. But I''m happy with the second place. I only got to ride once this week, so we came here, and we got second, back in the points lead. [I] do want to win but it''s all good, [to] get out of here healthy." 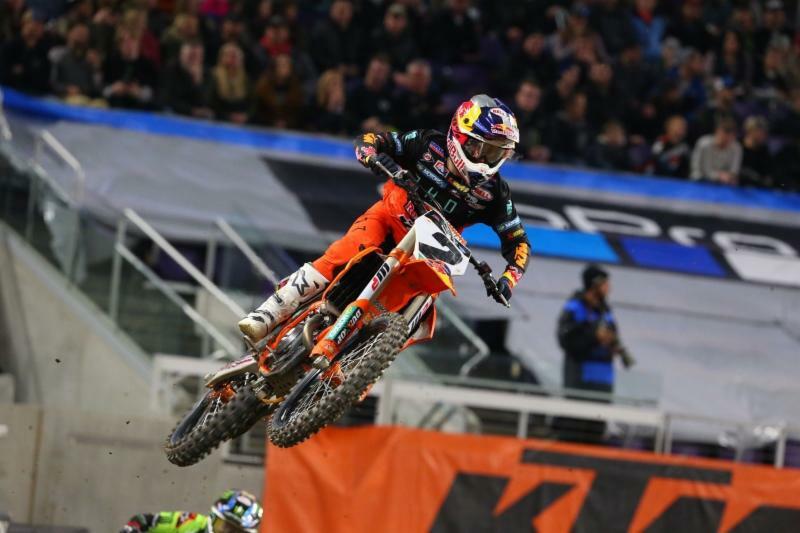 Musquin''s third place put him only two points out of the championship lead. Amazingly, that also means he''s in fourth place in the points. He referred to his heat race where he uncharacteristically made four mistakes in the closing laps to put himself in a bad position for his gate pick for the Main Event. "Third place is a good spot. It was a tough track, a tough heat race, I was running second, made a few mistakes and qualified eighth. That''s not good when you get on the gate like 16th I think... I was all the way inside. I knew I could make it happen and I was maybe in the top eight, top ten off the start. So, it was tough; tough to pass so it was not ideal. But I tried my best, I gave 100% and capitalized a little bit on some of the mistakes of the other guys, especially Baggett towards the end, hopefully he''s okay, that was a gnarly crash there." In the Eastern Regional 250SX Class it was a thrilling race for everyone except winner, Monster Energy Pro Circuit Kawasaki''s Austin Forkner, who was the day''s 250SX Class'' fastest qualifier, won his heat, and won the 250SX Class Main Event without a serious challenge. TLD/Red Bull KTM''s Jordon Smith''s race started with a last-minute rear tire change on the line as the 30 second board counted down. When the gate dropped Forkner holeshotted and took off; Smith was back in about fifth. He worked his way into second before stuffing his front tire in a berm and going down. He managed to fight back to second. Third place finisher Monster Energy/Star Racing/Yamaha''s Justin Cooper spent most of his race hounding JGRMX/Yoshimura/Suzuki''s Alex Martin and finally made the pass - with a block that forced Martin off the track as the riders faced the white flag. The 250SX Class podium, left to right: Jordon Smith, Austin Forkner, and Justin Cooper. Photo Credit: Feld Entertainment, Inc. Regarding the tacky dirt and deep ruts on the jump faces, Forkner said atop the podium, "It''s been a heck of weekend, honestly... Practice, like I said earlier, didn''t go the greatest. I really - my trainer Robbie Reynard had to just mellow me out. Like, I had the first-round jitters and I was riding too hard. I was over-riding the track in practice, and I know that I''ve been super good at the test track the past couple weeks, and I know how to ride, and what I was riding in practice just wasn''t it. And I cleaned it up and man [after that] I didn''t even feel like I was trying out there, honestly, but I feel like, with a track like tonight that''s what you have to do; you have to be smooth, just click off laps, and that''s what I did... ...I got the red plate, and I''m probably a little too excited for having the red plate after the first round; it''s a long series, but I''m pumped to get back to racing, I''m pumped to start it off like this." Austin Forkner started the Eastern Regional 250SX Class series by dominating the day. His early jitters didn''t show once the Main Event was underway. Photo Credit: Feld Entertainment, Inc.
Jordon Smith had anything but a smooth ride to second place, starting with the rear-wheel swap that was done literally on the starting line with seconds to spare, "They got that thing changed so fast, and I can''t thank my mechanic enough, Christian, and Wayne all of them tonight to get that wheel on and get it switched, that was unbelievable. Then I had time for about one deep breath before I took off, and off we were." In only his second Monster Energy Supercross, Justin Cooper said from third spot on the box about pressuring Alex Martin for much of the race, "I just let it come to me. It was kind of me versus him for the last spot on the podium. I was feeling good, I was kind of seeing where he was making mistakes and I could kind of get close. I knew time was running out and I had it on the pit-board every lap, ''Go, Go, Go!'' so it was time to make the move, so I stepped it up and just attacked him. I don''t think he really saw it coming, but it was great. Second [Supercross] race ever, I can''t be more pumped. This is awesome being up on the podium. Good start to the season." Minneapolis also played host to the launch of the philanthropic partnership between Feld Entertainment and St. Jude Children''s Research Hospital where more than 100 Supercross athletes and influencers kicked off a fundraising and awareness campaign that will be showcased during each of the 11 remaining races through on-air, digital and social media promotion. The total funds raised for St. Jude during the season will be announced during the live broadcast of the 2019 Monster Energy AMA Supercross Championship,an FIM World Championship, at Sam Boyd Stadium in Las Vegas on May 4. 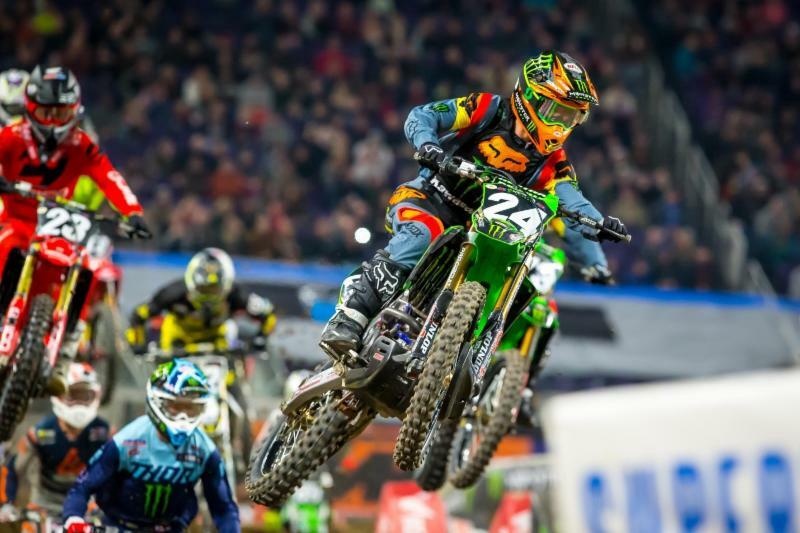 Next Saturday Monster Energy Supercross carries the battles into AT&T Stadium in Arlington, Texas for round seven of the 450SX series and round two for the 250SX East Coast riders.